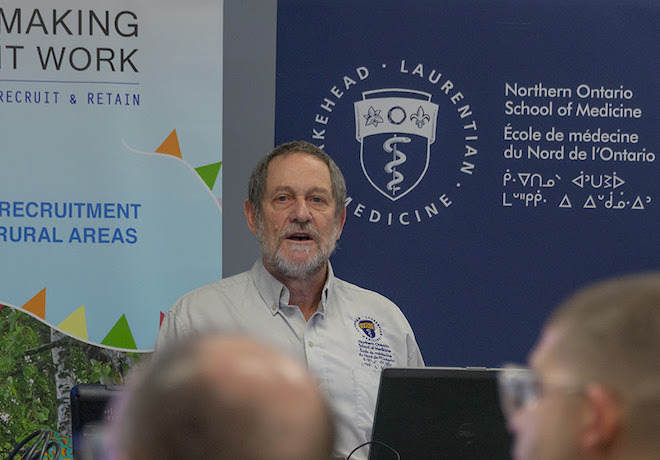 The Northern Ontario School of Medicine (NOSM) today hosted the Remote Rural Workforce Stability Forum, an international, multi-site forum on physician recruitment and retention. The forum focused on recruitment and retention of the health workforce in rural and remote communities and the role of medical schools, health service organizations, communities and government in creating workforce stability. NOSM was established as a government strategy to address the health needs of Northern Ontarians, improve access to quality care and contribute to the economic development of the region. Physician recruitment and retention has long been one of the most pressing concerns in the North. The Making It Work Framework for Remote Rural Workforce Stability, is the result of a seven-year international partnership between institutions in Sweden, Scotland, Norway, Iceland and Canada, and provides a set of key areas of activity—including community engagement, supporting families, and training future professionals—that, when implemented as a holistic, integrated set of interventions, can create the conditions necessary to establish a stable and appropriately skilled health-care workforce in rural and remote communities. Attendees learned about the Making it Work Framework and case studies carried out in each of the participating countries and also participated in a Knowledge Transfer in Action session, integrating key learnings from international rural health human resources work to the Northern Ontario Physician Resources Action Plan developed over the past year as a result of Summit North—a symposium in January 2018 that brought together policymakers, educators, administrators, community members and clinicians from across Northern Ontario to address the issue of health workforce recruitment and retention in rural and remote communities. The Action Plan builds on existing recruitment and retention strategies across the region. At NOSM, several measures are in place to support physician recruitment and retention: encouraging high school students from rural and remote communities to see a career in health care as an opportunity that’s available to them; an admissions process that favours applicants from Northern Ontario and reflects the population distribution of the region; a distinctive Distributed Community Engaged Learning model that places students in communities so they focus on responding to the health needs of the population; involving rural generalist faculty members as principal clinical teachers and role models; and having a rural and remote First Nations stream in our family medicine residency program. This model is a proven success in some Northern Ontario communities. A study recently published in Canadian Family Physician found that NOSM students and graduates had a positive view of rural generalism, and their experience and exposure to rural community practice was highly influential in determining their career directions. A 2016 study examining eight communities that were successful in recruiting family doctors to their communities, found that five of those communities which had previously struggled with chronic doctor shortages had moved to a more stable situation. All participants in the study agreed that NOSM played a prominent role in physician recruitment to underserved communities in Northern Ontario. Research has also shown that NOSM, including its education and research programs, is having a positive economic impact on Northern Ontario communities. In 2017, NOSM had an estimated economic impact of $122-$134 million in Northern Ontario, and overall spending was estimated to support 729-802 full-time equivalent jobs in the region.